As we planned our trip to India, we had a vague semblance that we were going home to our (vegetarian, spice-loving) people. We knew that the cow was sacred in Hinduism and that McDonald’s in India didn’t have hamburgers. We liked the Indian food we had in the states and in Japan well enough (Japan has a surprising number of Indian and Nepalese restaurants). Cascadian Bob’s plate on our sailboat journey on the Ganges. 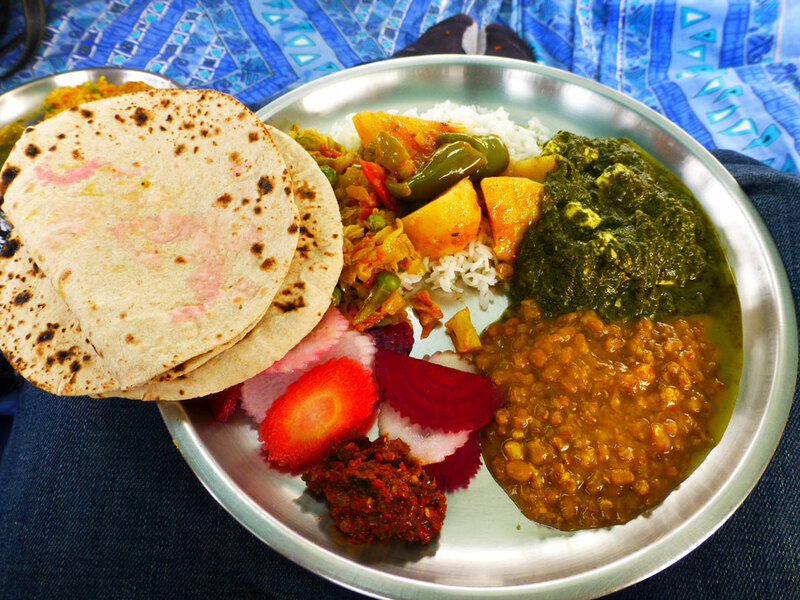 From top: aloo, saag paneer, dal, spicy chutney, beets and carrots and chapati. One of the boats held a cook and food supplies for our overnight journey. But I would have never guessed how incredibly amazing and flavorful actual Indian food is. We never got sick of it, even after three meals a day for 10 days. 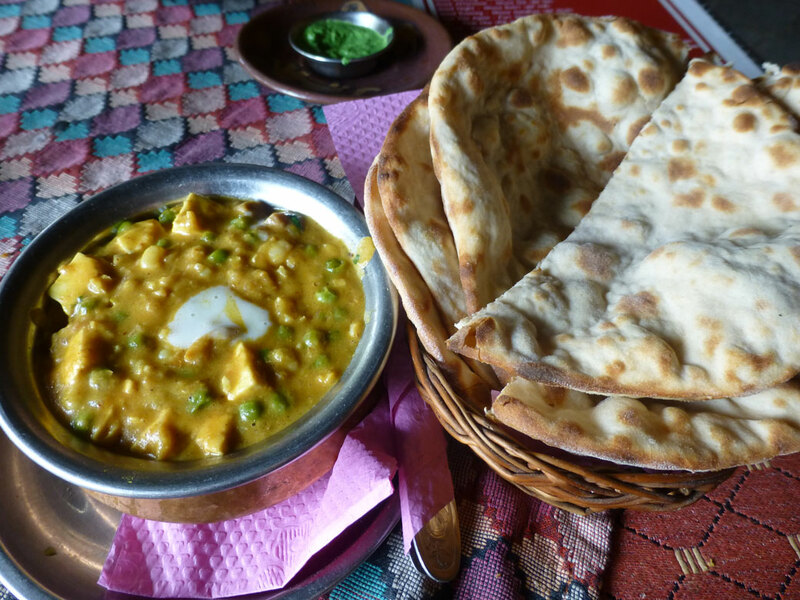 Nepal (seven days) had similar food to India, but with a little less spice and pizzazz, in our opinion. Quick note on spice: even though we asked for it, we never had really spicy (as in, ‘this is so spicy, I am going to die!’) food in India (or Nepal or Thailand). I think it’s because the locals thought we couldn’t handle it. Shame! 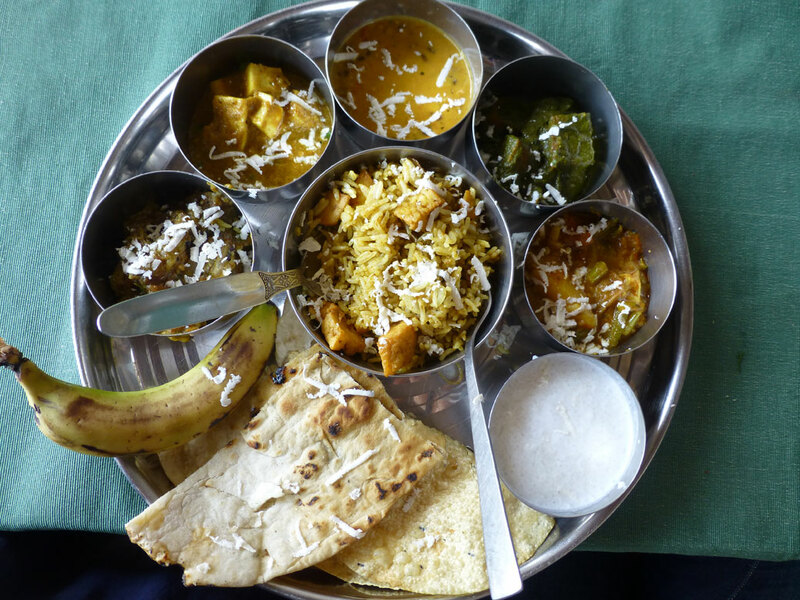 A Thali meal is a selection of many different dishes. It’s served on a steel tray with separate small bowls. It’s fun to order and try a variety of things. It usually includes a rice dish, dal, vegetable curry, roti, chutney or pickle, papad and a dessert like the rice pudding pictured here. As we were traveling, I was reading books about India. One of which is called “Climbing the Mango Trees” by Madhur Jaffrey. This book hit me at the right time in our travels. The author describes her childhood in India through the lens of the food her family ate. She intertwines food with history, describing the influences of Persian or Muslim dishes on the traditional Indian or Hindu ones. She also accounts a home economics test of cooking bland English (British) porridge. Every time she mentioned a dish, I thought, “Hey, I just ate that!” She gave a historical, firsthand account of her memory of India’s first Prime Minister Jawaharlal Nehru and the tensions in India about British interference (my word, not her’s), whether the country should split into Hindu and Muslim nations (which, unfortunately, it later did in the Partition, creating Pakistan in 1947) and Gandhi’s funeral. When we visited Nehru’s home in Allahabad, we got to see where many of these historical deliberations were made, including Gandhi’s office. 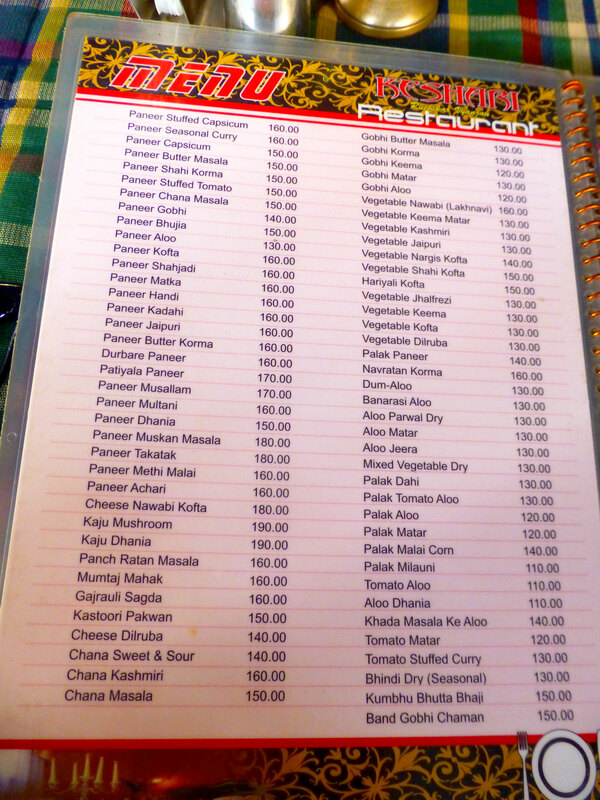 An example of a typical Indian restaurant menu. Main dishes are from 110 ($1.75) to 180 ($2.90) rupees. Some Indian people we met claimed that foreigners were charged tourist prices. Even if we were “overpaying,” we sure didn’t mind! We could both order a main dish, bread, drinks and maybe a dessert for about $5 to $10 a meal. I’ll explain more about our cooking classes and share a few recipes in part 2 of this post. Vegetables—There were many fresh vegetable stands on the street. Potatoes are used a lot, along with garlic, onions and chili peppers. Our cooking host said that if her children wanted a dish with peas, they had to shuck them the night before (no frozen peas here!). We also saw mustard greens with their yellow flowers growing in Nepali fields; we later ate this seasonal green in a Nepali cooking class. Palak—spinach. Check out my recipe for Aloo Palak. Chutney—refers to a sauce or fresh, chopped salsa of vegetables or fruit. This was not like a sweet jam, as we’ve previously had chutneys. More like a chimichurri or pico de gallo. Robert ordered this Mukthaj Curry with naan. The curry had paneer cheese and peas in a sauce with fresh ginger, onions and green peppers. Legumes—Cheap and filling! 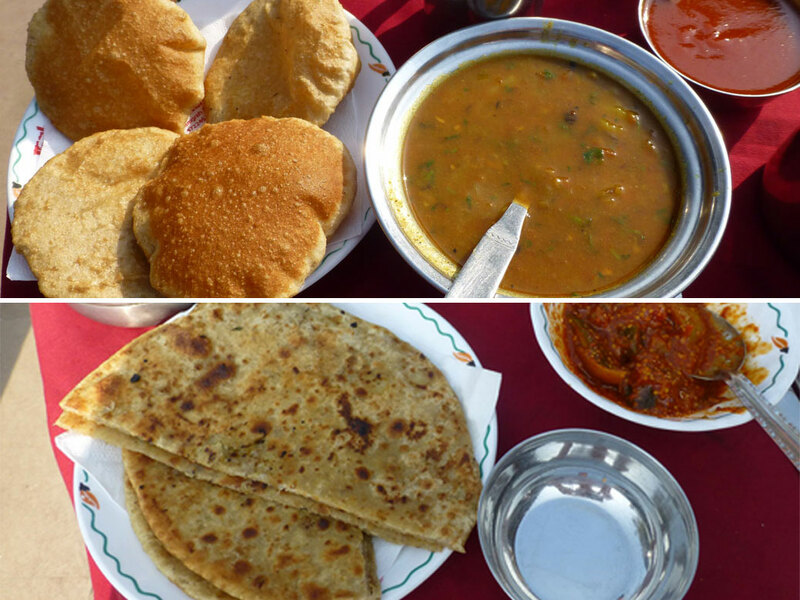 We had a great variety of dal dishes, spiced in many ways. Dal—can refer to any legume (bean, pea or lentil). There are many types of dal, such as black, green, red, yellow, mung, etc. It can also mean lentil soup as we found out in Nepal. Dairy—We saw a lot of dairy used in Indian cooking. Milk was boiled in a huge pot and sold on the street. Yogurt, cream, butter and paneer is made fresh daily. Paneer—cottage cheese, large curd. Freshly made. Ghee—clarified butter. Used in place of oil when cooking and in desserts. You can buy it already made, but our cooking class instructor said she made her own. Raita—yogurt sauce, can be flavored in many ways, but we usually had it plain. Meat—Most of the castes in India are vegetarian, but a few are not. They eat chicken, fish, wild boar and mutton. The Nepalese eat buffalo (which bears relation to the cow), but the Indians do not. Mutton—can refer to goat or lamb/sheep. Grains—The base for every meal. The rice was flavorful (I’m not a rice fan), but we especially liked trying the different types of bread. The only kind we had tried previously was naan. Now, roti is our favorite! And stuffed paratha. And masala dosa. And pakori. Yum! Roti/chapati—wheat flatbread. Unleavened. Just flour, water and salt. Naan—yeasty, bubbly, teardrop-shaped bread cooked in a tandoor oven. Papadum/papad—thin, crispy cracker usually served as an appetizer or with beer. Or as part of a Thali meal! Paratha—flatbread like a pancake. Sometimes stuffed with aloo (potato) or vegetables. Basmati rice—very long grain rice. This is an expensive type of rice and reserved for special occasions. Biryani—main rice dish with vegetables and/or meat and spices. Can be served with raita. Pulao—(rice) pilaf. A Persian influence. Tandoori—style of food or bread that is dry cooked in clay pot/oven. This style of cooking became mainstream in India (and eventually all over the world) after the Partition when Hindus who moved to India from what is now Pakistan brought their tandoor ovens with them. Poori/puri—deep-fried puffed bread. We had this for breakfast with curry. We ordered some basic Indian dishes for breakfast. Breakfast is not a big meal. Top is poori bhaji, fry bread and curry. On the bottom is stuffed paratha with spicy pickled vegetables. Samosa—deep-fried dumplings stuffed with potatoes, peas and cumin spices. 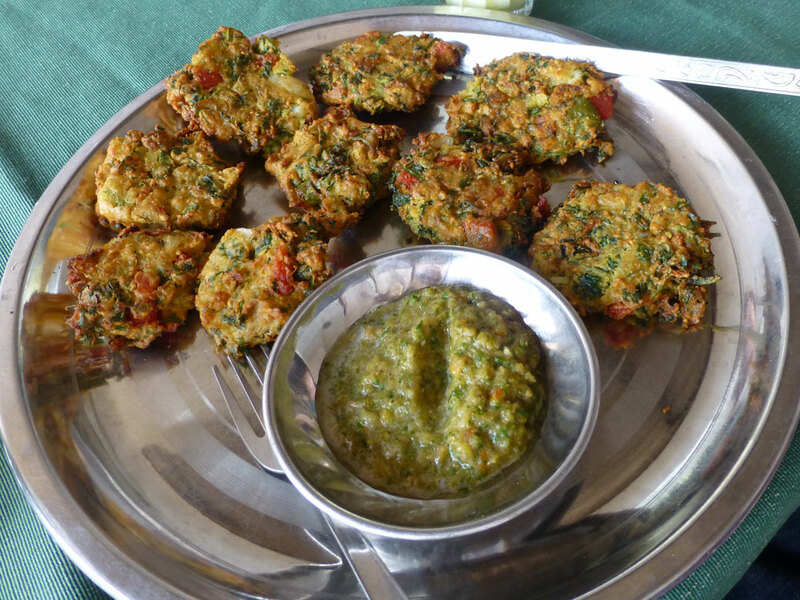 Pakori—fried vegetable fritters with chickpea flour. These fried vegetable pakori and chutney hit the spot after a long day of sightseeing! Kofta—deep-fried vegetable dumpling, usually in a brown gravy or cashew-based sauce. Dosa—very thin crepe that can be filled with spices, dal, and/or paneer. A South Indian specialty. On the left is a dosa ordered from a restaurant. This one is a thin, rice pancake filled with paneer and chiles. On the right is a dosa being prepared by a street vendor. Sweets—Many of the sweets were dairy based—condensed milk, milk, ghee. Usually not too sweet. Barfi sounds terrible, but it’s so heavenly. Heaven must be made of milk, don’t you think? Barfi—similar to fudge; made with condensed milk, sugar and nuts. Usually has gold leaf on top. The pistachio ones were soo good. 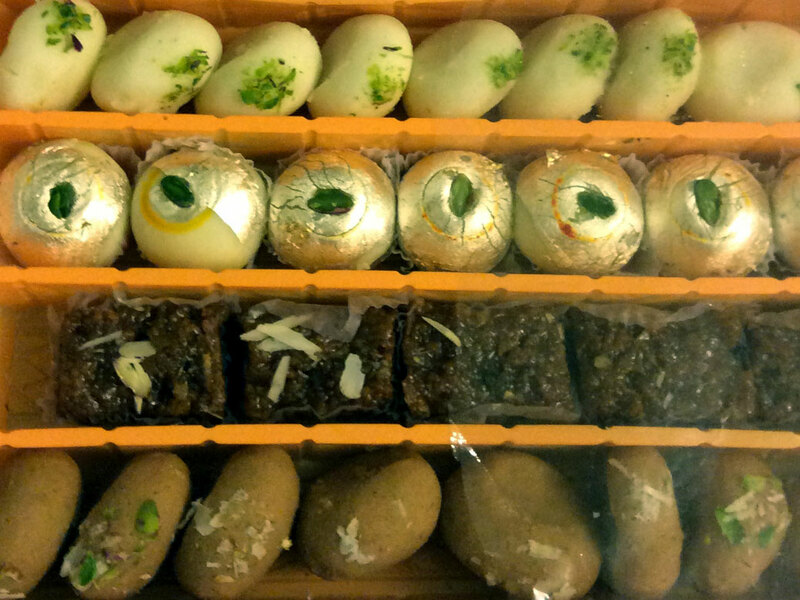 We bought this box of sweets, including pistachio barfi, on our first day in Delhi. Halwa/halva—can be made with flour or nuts. Commonly made with ground sesame seeds (tahini) and sugar. I grew up in a Russian household eating this as a dessert. Carrot halwa—a pudding made with grated carrot, cashew and sugar. I might have to make it at home! Street sweets. On the bottom left is jalebi, the pretzel-shaped donut. 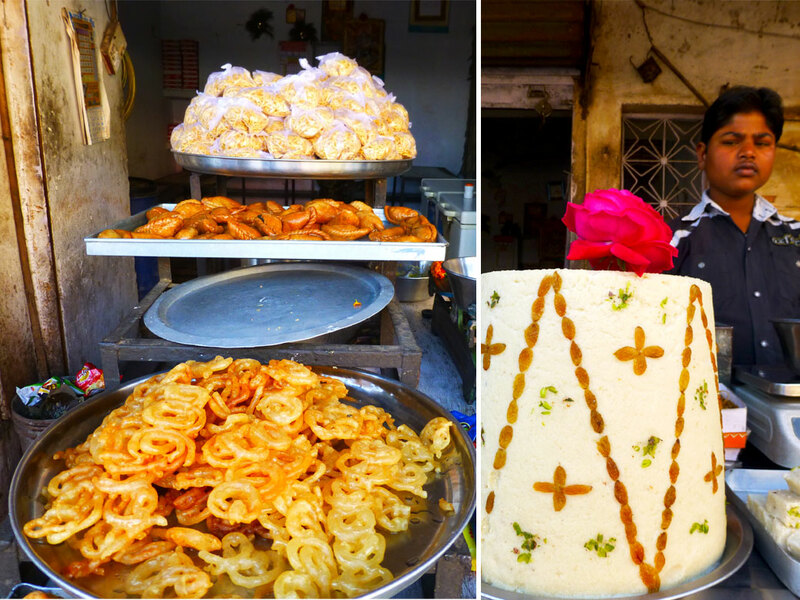 On the right, halwa is shaped and decorated. Pieces of halwa are shaved off and sold by the gram. Jalebis—squiggly pretzel-shaped donut soaked in sugar syrup. It’s a popular street food. Lassi—yogurt drink. Can be plain or flavored with fruit, nuts or spices. We were encouraged to sample flavors that were in season because fresh fruit puree would be added instead of flavored syrup. 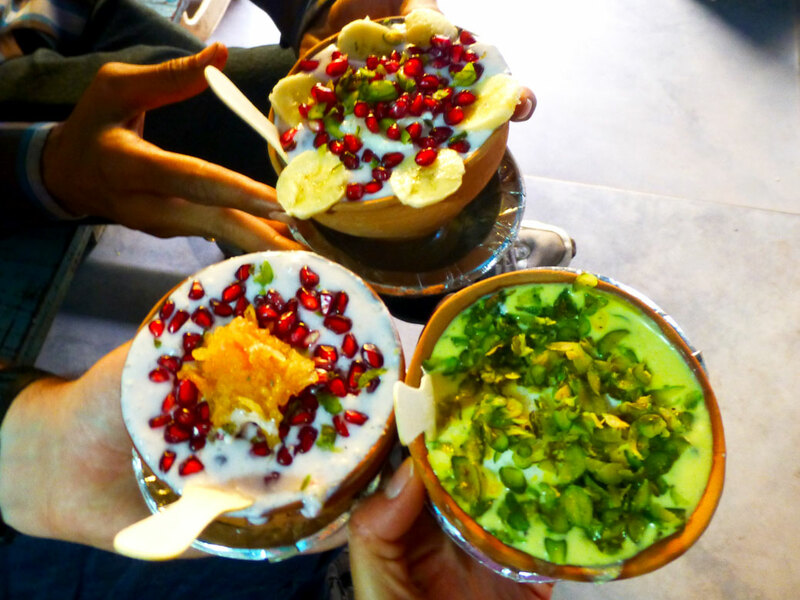 We visited Blue Lassi, a specialty shop making fancy lassis in Varanasi. From top: banana, saffron pistachio and papaya pomegranate flavors. Gulab jamun—Round balls are made from milk, fried, then soaked in a simple syrup. Fennel seeds and rock sugar—an after-meal breath freshener and digestion aid. Try it! Masala Chai (my recipe here)—spiced tea with milk and sugar. The spices are black peppercorns, green cardamom, ginger and cinnamon. We call it chai in the states, but Indian chai has much stronger spices. And deliciously so! 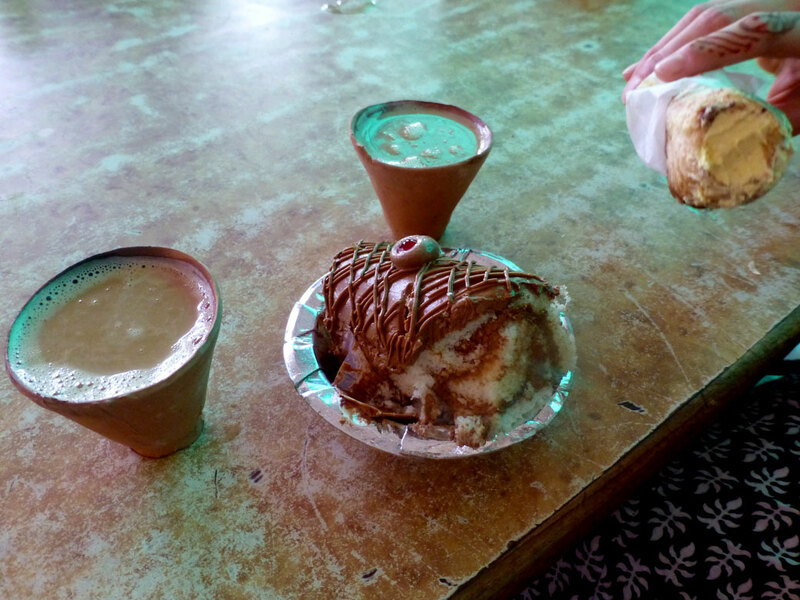 We enjoyed some Masala Chai in terra cotta cups along with some cakes at a bus stop. Writing this post made me hungry! What’s your favorite Indian dish?